Solar Art was lucky enough to do a really cool window graphics installation at the El Cajon animal shelter in San Diego, California! The animal shelter had not yet been opened and the customer was looking for a way to help increase privacy and add design to the shelter. 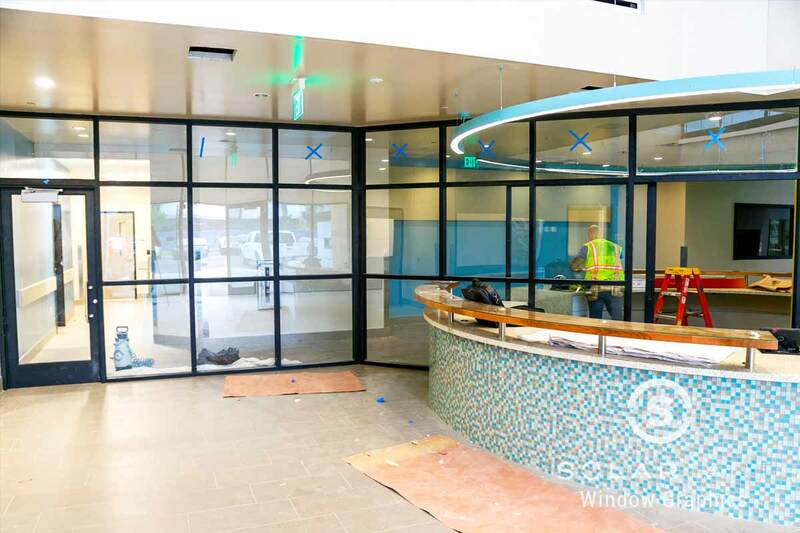 The customer was looking for privacy and design on an interior glass wall to prevent people in the lobby from being able to see into the adoption room. They didn’t want anything permanent and they were looking for something that would make the room light and fun. 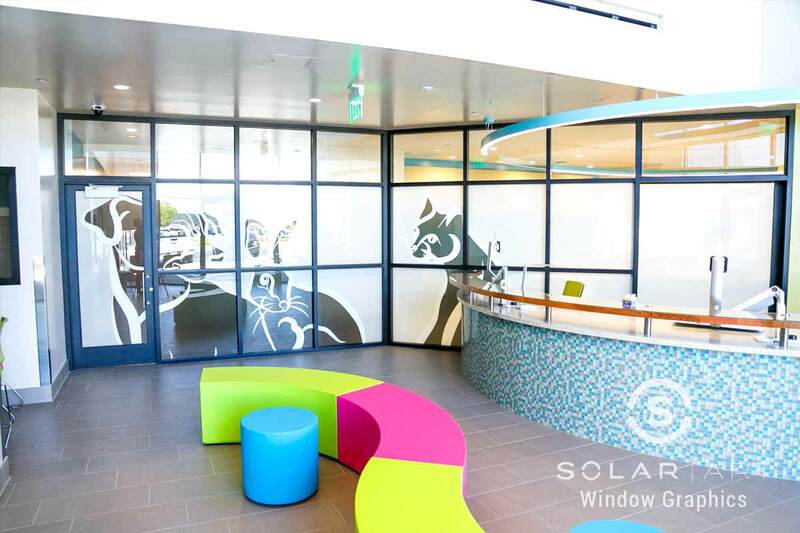 They reached out to Solar Art to see what their different window film options were.They worked with our in house graphics team to figure out the perfect window graphics for the space. The customer supplied the artwork of the dog, cat and rabbit and worked with our graphics team to perfect the order, location and overall look. Proofs were sent to the customer so they knew exactly what the ending result would look like and could approve it before the installation was completed. The window graphics were installed with a frosted window film to ensure privacy in the adoption room, which was one of the goals of the installation. In addition to the window graphics, Solar Art also installed Llumar Frost on the windows to prevent customers from being able to see through. The customer was extremely happy with the results of the installation. The window graphics created a custom design that no other business would have. The window graphics were welcoming and warm while still providing privacy from the adoption room. If the customer decides later on they no longer want the window graphics, they can easily be removed. In addition to window graphics, Solar Art also services wall graphics, solar film, decorative window film, anti graffiti film, security window film and exterior building wraps. Solar Art does residential and commercial installations in the San Diego, Orange County, Los Angeles, San Francisco and Seattle areas. Contact us today for a free quote! Contact us directly to talk about custom graphics! Window graphics give you the flexibility to create any artwork or design you would like. Window graphics are easily removable and work great in both residential and commercial settings. Contact Solar Art to learn more!